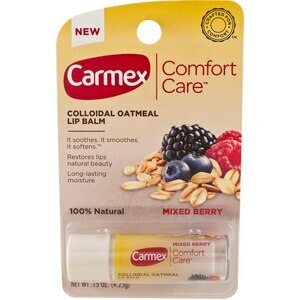 Carmex Comfort Care Lip Balm helps restore your lips natural beauty with a unique blend of natural colloidal oatmeal and cold-pressed antioxidant rich fruit seed oil to provide long-lasting moisture for visibly smoother lips. Apply evenly to lips. Reapply as needed. PROTECT THIS PRODUCT FROM EXCESSIVE HEAT. DISCONTINUE USE IF IRRITATION OCCURS. KEEP OUT OF REACH OF CHILDREN.